NOAA began database development in 2014 with the IHO Crowdsourced Bathymetry Working Group. The database is part of the IHO DCDB and is hosted at NOAA’s National Centers for Environmental Information (NCEI), which offers access to archives of oceanic, atmospheric, geophysical, and coastal data. Sea-ID, a maritime technology company, provided early testing and support and is currently working to encourage data contributions from the international yachting community. Ongoing participation from Rose Point Navigation Systems, a provider of marine navigation software, helped kickstart the stream of data from a crowd of mariners. The crowdsourced bathymetry database now contains more than 117 million points of depth data, which have been used by hydrographers and cartographers to improve chart products and our knowledge of the seafloor. 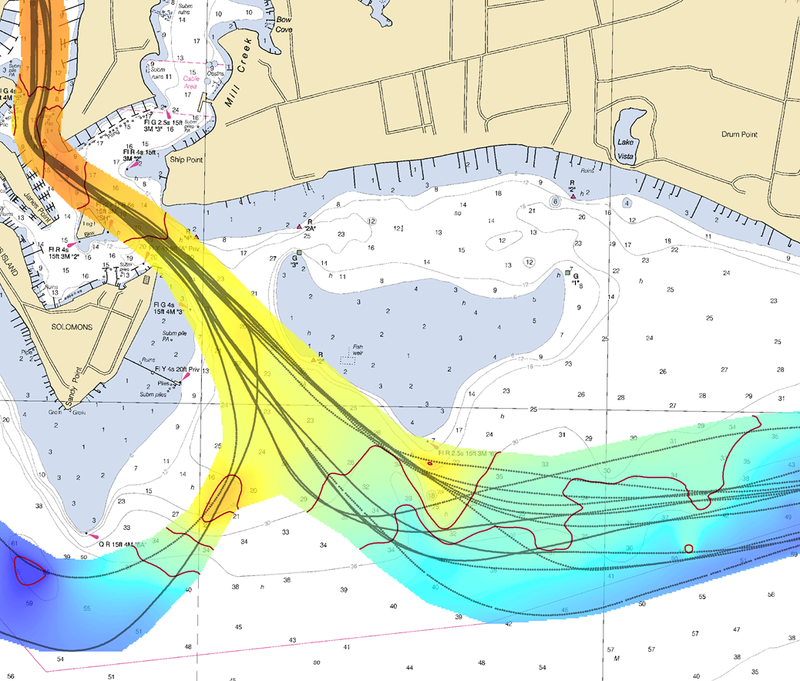 NOAA, working with George Mason University, is using the database depths to assess nautical chart adequacy, determine when areas require updated survey information, and identify chart discrepancies before an incident occurs. The Canadian Hydrographic Service used this dataset to update several charts of the Inside Passage, a network of coastal routes stretching from Seattle, Washington, to Juneau, Alaska. Data are contributed to the database through a variety of trusted sources (e.g., partner companies, non-profit groups)—referred to as “trusted nodes”—that enable mariners to volunteer seafloor depths measured by their vessels. Contributors have the option to submit their data anonymously or provide additional information (vessel or instrument configuration) that can enrich the dataset. The trusted node compiles the observations and submits them to the crowdsourced bathymetry database, where anyone can access the near real-time data for commercial, scientific, or personal use. NOAA invites maritime companies to support this crowdsourcing effort in their systems by making it simple for users to participate. For example, Rose Point Navigation Systems further promoted the IHO crowdsourced bathymetry initiative by moving the option to collect and contribute bathymetry data to a more visible section of their program options menu. By submitting crowdsourced bathymetry data, mariners provide a powerful source of information to supplement current bathymetric coverage. Nautical charts need to be updated as marine sediments shift due to storm events, tides, and other coastal processes that affect busy maritime zones along the coast. Crowdsourced bathymetry data helps cartographers determine whether a charted area needs to be re-surveyed, or if they can make changes based on the information at hand. In some cases, crowdsourced bathymetry data can fill in gaps where bathymetric data is scarce, such as unexplored areas of the Arctic and open ocean and also shallow, complex coastlines that are difficult for traditional survey vessels to access. Crowdsourced bathymetry data is also used to identify dangers to navigation, in which case NOAA can issue a Notice to Mariners about the navigation hazard within 24 hours. The utility of crowdsourced bathymetry data extends beyond the territory of the United States and into international mapping efforts. Seabed 2030 is a global mapping initiative to produce a complete, high-resolution bathymetric map of the world’s seafloor by 2030. GEBCO (which operates under the IHO and International Oceanographic Commission) and the Nippon Foundation launched the initiative in 2017, and received NOAA-wide commitment of resources and support. Seafloor mapping is integral to many NOAA products, and crowdsourced bathymetric data supports NOAA’s Integrated Oceans and Coastal Mapping (IOCM) initiatives to maximize potential sources and use of mapping data. Crowdsourced efforts are poised to become a major source of information for improving nautical chart coverage and accuracy, and the crowdsourced bathymetry database contributes to national and international seafloor mapping efforts as a growing repository of bathymetric data.